The 1995 animated adventure Pocahontas is known for being the first Disney animated feature to be based on a real historical figure. It’s not a perfect telling of the tale by any means, according to many sources including the now deceased Chief Roy Crazy Horse. It’s a movie that is only moderately accepted by critics, but at the same time it has an loving fanbase. Where it excels is in being one of the most visually stunning animated movies ever made. 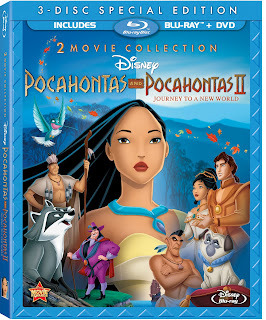 Now, with the new Blu-ray release that also includes Pocahontas II: Journey to a New World, you can bring that beauty into your home. This Blu-ray has a few bonus features, but the real standout is that it contains an entire, never released disney movie. With Drawing Inspiration: The Lost Story of Hiawatha, we learn that in the 1940s Walt Disney had begun work on a film about Hiawatha. His inspiration was the Henry Wadsworth Longfellow poem of the same name. This movie was complete story boarded, but then shelved in 1949. Eventually it’s artwork became the inspiration for the art found in Pocahontas. What’s really neat is that we get a run-through of the storyboards for Hiawatha as if it were a completed movie. Included is a piece about the deleted song “If I Never Knew You”. It allows for you to watch this scene that was added back into the movie for it’s 10th Anniversary DVD release as an optional feature. Here you can watch the entire scene with or without commentary from the movie’s directors Eric Goldberg & Mike Gabriel, and producer James Pentecost. They talk about how the song simply didn’t test well with audiences at the time. And how, after much discussion they decided that despite animation on the scene being almost complete, they would remove it for the theatrical release. The Music of Pocahontas talks about how with the death of Howard Ashman, led to Alan Menken working with lyricist Stephen Schwartz to create the music for the movie. You can tell from this not just how much they enjoyed working together, but how well they did. It’s a very nice piece and allows you to see some of how this Oscar winning team came to be. Also found on this Blu-ray is the Disney 1937 Silly Symphony “Little Hiawatha”. It’s nice to have this included, and be reminded again of Walt’s fascination with the legendary figure Hiawatha. There are also several deleted scenes to be found on the Blu-ray, which are always interesting to watch, and help you to better understand the shaping and planning of the movie. The previews include both the Blu-ray release of the 35th Anniversary Edition of The Rescuers as well as the Blu-ray release of The Aristocats - both of which were released at the same time as Pocahontas. There’s an additional feature where you can Discover Blu-ray 3D with Timon & Pumba. I sort of felt this piece was out of place on a non-3D Blu-ray. You can tell it is intended for people who own a 3D system already, as it has the usual 3D “gags” like reaching out with a stick, etc. It just didn’t seem to translate well on a non-3D system. One of my favorite things to do while going through the Blu-ray was to play what I’m calling “spot the totem”. Throughout the menus and interstitials you’ll find all the little, colorful “totem” symbols that are seen as part of the “magic” in the movie. They bring a nice cohesive element to the Blu-ray’s structure. Fans of the movie, especially those trying to convert their libraries over to Blu-ray, will want to own this. Note: The Disney Film Project Podcast will be reviewing the movie Pocahontas later in 2012. PocahontasI its my favorite movie. I love all the nature and costumes and the "history". I love Pocahontas, but i cant get over Mel Gibsons "Non" accent.